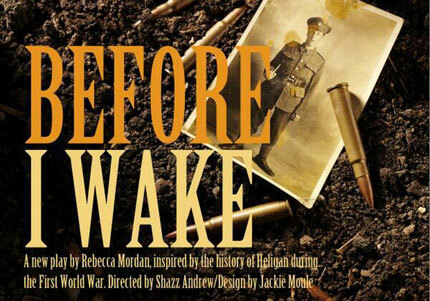 Powerful and much-loved original Cornish play Before I Wake returns in 2018 to mark the centenary of the end of World War I – now with a full professional and youth cast. 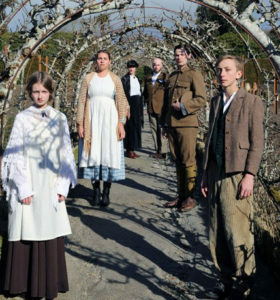 You can experience this poignant, heart-warming drama at The Minack Theatre, 21st-25th May (matinees 22nd & 24th May) and at The Lost Gardens of Heligan, 29th-31st May. Spring in Cornwall; birds are singing, veg is growing and in a little fishing village on the edge of the Heligan estate fancies are turning to thoughts of love… But in Europe war is looming. Friends and lovers are signing up and leaving. How will the closely-knit community of families and neighbours deal with the pressures of enlistment, the call of duty, and ultimately the loss…? Before I Wake is based on the true stories of Hilda, William and their friends, the gardeners who wrote their names on the sheds at Heligan before they left for the trenches. This tender play brings back to life a cast of characters still remembered by their families today. Share their hopes, dreams, laughter and tears in the stunning environments they knew and loved – and be touched by the very human stories of a Cornish village struggling to make sense of a world at war. Originally commissioned and staged in 2014 by Cornwall Youth Theatre, to commemorate the start of WWI, Before I Wake returns in 2018 to mark the centenary of the end of the war. Now with a full professional and youth cast, Rebecca Mordan’s powerful and heart-warming tale gains added poignancy as we remember the end of the war with a new staging at The Minack and The Lost Gardens of Heligan. Booking is open now.